If you've ever visited Greece, you must've had shrimp in tomato feta sauce, or Garides Saganaki as the dish it's called here. It's one of the top Greek appetizers and one of the tastiest dishes you will ever try. You can also have this as a main dish, if you serve it with French fries (or rice). Saganaki is a frying pan with two handles, used to cook several appetizers. Therefore, each appetizer prepared in it is called saganaki, like cheese saganaki or mussels saganaki or clams saganaki etc. In taverns and restaurants it's not uncommon to serve the appetizer in this small skillet. Shrimp saganaki is one of our favorite dishes prepared that way. Since it was a bit difficult to find the specific special skillet in every household, many baked versions of shrimp saganaki were also developed. Roasted shrimp with feta and tomato is usually cooked in ceramic baking pans/casserole dishes. Those are baked in the oven and lack nothing in taste! This recipe for shrimp saganaki is Panos's mother Eleni old recipe. 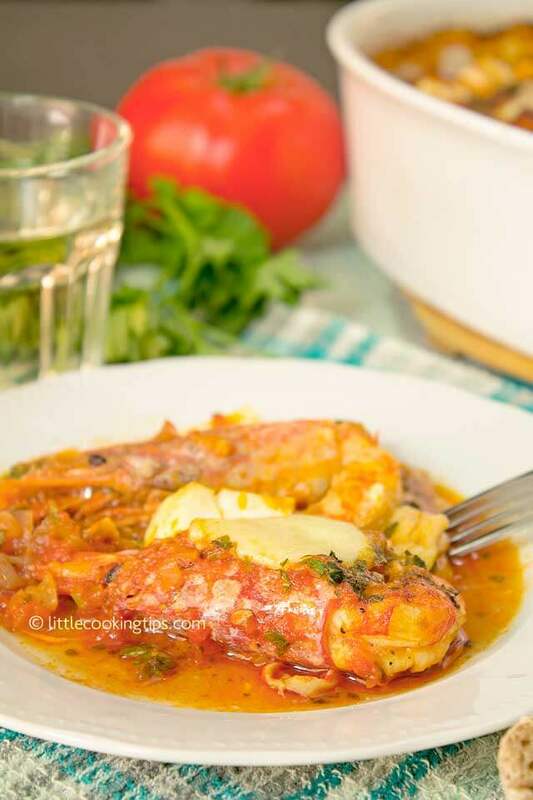 It's a baked shrimp in tomato feta sauce recipe, prepared in the oven in a casserole dish. She was using white wine. Ouzo is also used for flavor (instead of wine), but as ouzo was not always available she preferred the wine. You can make this recipe with wine and then try it also with ouzo to see the difference. For this shrimp dish you can either use shrimp or prawns, it really doesn't matter. Here in Greece we almost always use shrimp. It's better to use medium or large shrimps, as they have more meat, but feel free to try this with smaller shrimp that are more affordable. You can also use frozen shrimp, make sure to thaw them appropriately. We suggest that you also use the heads of the shrimps, as they have much flavor to offer. The secret for this recipe is using a) ripe fresh grated tomatoes (they taste better if they're organic) and b) a good quality authentic (sheep's milk) feta. After all, those are the main ingredients: shrimp, feta cheese, tomatoes. So buy the best quality feta and tomatoes you are able to afford. The herbs used are mostly parsley or fennel fronds and stalks. Some people also use mint. Feel free to try them all. Many people prefer this dish a bit spicy, so they add some red pepper flakes (chili flakes).We like it milder ourselves so we don't add them. Again, you can add as much as you like if you want a spicy result. Make sure to have some fresh crusty bread on the side to scoop up the amazing sauce from the dish. It's absolutely divine. You can also use any leftovers as a sauce for pasta and make another delicious dish. So let's see how to make this recipe for shrimp with feta or else garides saganaki! - 1kg/35oz/2lb whole shrimps. If using tails only, you need 500gr/17.5oz/1lb. * If you can't find graviera, you may use any hard cheese you prefer, like pecorino. Parmesan is not recommended in this recipe. Remove the shell from the tail of each shrimp (pic.1-2), leaving the head on for a nicer presentation. If you find it a bit difficult to handle the shrimp with the head on, remove the head but keep it aside. You will add it with the cleaned shrimp in the baking pan in a next phase. Make a slit along the back of the tail (pic. 3-4) to expose the vein. Remove it (pic. 5) and rinse the shrimp. Keep it aside and continue processing all of them. Put a deep frying pan or a saucepan on medium to high heat and add the olive oil. Once hot, add the onion (pic. 6) and stir until translucent. Add the garlic (pic.7), stir for 1 minute. Add the tomatoes (pic.8) and the tomato paste (pic.9). Cook until the sauce thickens and add salt (just a little because the recipe includes the salty cheeses), pepper. Add the oregano and stir (pic.10). Add the wine and cook until it thickens again (pic.11). Keep this sauce aside. Sprinkle with parsley (pic.14). Bake in preheated oven for 10 minutes at 200 degrees Celsius / 390 Fahrenheit. Add the graviera and feta cheese (pic.15). Continue to bake for another 10 minutes. Serve with lots of fresh crusty bread. Enjoy! 1. Serve with cool white wine or some ouzo with ice! 2. If by any chance there are any leftovers, you can use them as a great sauce for pasta! 3. You can use fennel fronds instead of parsley. 4. You can add red pepper flakes in the tomato sauce for a spicier result.